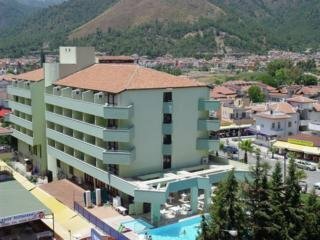 The Kapmar Hotel is located right in the center of the popular summer resort of Icmeler on the coast of Turkey. This is a great hotel for couples and families with a wide range of shops and restaurants nearby and only 250 m to the beach. 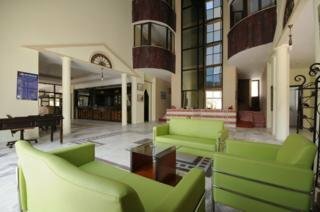 All 80 attractive rooms over four floors are comfortably furnished with modern amenities. Guests to the Kapmar Hotel can discover marvellous beaches, explore the delightful villages nearby and experience real Turkish hospitality. Dalaman International Airport is 90 km from the hotel. Local Tips: Icmeler was originally thought of as part of Marmaris but has now developed its own identity. After dark there are a good selection of restaurants, bars and discos. The interesting old town is 5 minutes from the Kapmar Hotel. Food, drink and entertainment: Bed and Breakfast accommodation with indoor and outdoor a la carte restaurants and a bar. Many cafes, restaurants and bars within walking distance of the hotel. 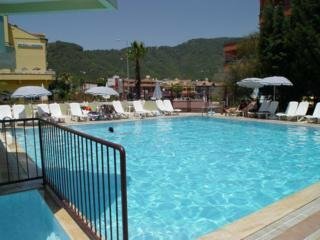 Sports, games and activities: Sparkling swimming pool, childrens pool, sun lounge. Additional: 24-hour reception with friendly and helpful staff. 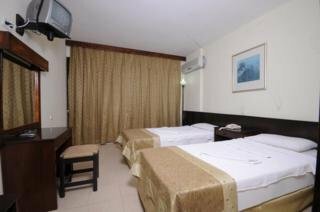 The Kapmar Hotel features 80 air-conditioned, attractive rooms over four floors with 2 lifts. Standard single, double and triple rooms have private bathrooms with 24 hour hot water, direct telephone, TV, hair dryer, dressing table and mirror, wardrobe, dresser, safe deposit box (with charge) and private balcony with land views. Rooms are cleaned every day and linen is changed every two days. Rooms for handicapped guests are available.